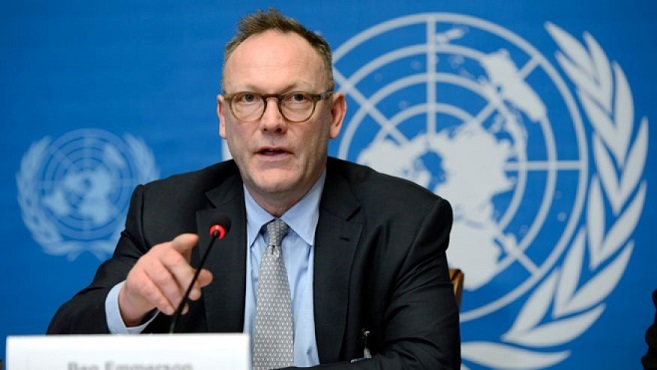 Ben Emmerson, UN Special Rapporteur on Counter Terrorism and Human Rights, speaks during a press conference in March 2014 about his annual report to the Human Rights Council on the use of remotely piloted aircraft, or drones, in extraterritorial lethal counter-terrorism operations, at the European headquarters of the United Nations, in Geneva, Switzerland [Image: AP Photo/Keystone,Martial Trezzini]. Why Jews News used this photograph is beyond the wit of This Writer. As might be expected from an article on a website calling itself Jews News, following its top three paragraphs the article progresses in a highly critical way. Most notable about the criticisms is that they discuss the UN’s resolutions against other countries, as if to say it is wrong for Israel to be criticised alongside – or more than – them. That’s a false argument. Two wrongs don’t make a right. This Writer, if not the UN, would far prefer at least an attempt at defending Israel’s human rights record, rather than a bid to deflect attention onto other countries. That’s a ‘dead cat’ strategy – and we see enough of them here in the UK at the moment, thanks to Lynton Crosby and his Tory disciples. NB. The Jews News article was forwarded to Vox Political by a reader, presumably in connection with the current debate over alleged anti-Semitism in the UK. More rational pieces may also exist, and This Writer would certainly appreciate a chance to see them. What country deserves more condemnation for violating human rights than any other nation on earth? According to the UN’s top human rights body, that would be Israel. Last week, Israel was the UN’s number one women’s rights violator. This week it is the UN’s all-round human rights villain. The UN Human Rights Council wrapped up its latest session in Geneva on Friday, March 27 by adopting four resolutions condemning Israel. That’s four times more than any of the other 192 UN member states. But at least they look after their disabled better than we do in the UK! Again, that’s a distraction, pointing at the way we treat our disabled people. I don’t know whether your comment is accurate the way sick and disabled people are treated in the UK disgraces us all. If this was another nation but Israel, there’d be hell on but because it is Israel, any criticism said towards them, out comes the race card and the attack dogs to silence us all! Well, imagine that – four times more than any other UN member state! It just shows how terrible the illegal zionist state must be, doesn’t it? Has any of that penetrated the mind of even one single zionist? Somehow, I really don’t think it has. They simply block such acts out of their minds, it seems to me. What else can one expect from mass murderers? 98 murdered at the King David Hotel in Jerusalem? 2,200 murdered in Gaza in 2014, including 500+ children? No wonder they have such an unenviable reputation. Incidentally, it is zionists – not jews – who perpetrate these inhuman acts. Why do you keep saying Israel is illegal? It was created by order of the United Nations, I thought. Also, for all that I deplore the Palestinian deaths, I understand that Israel was responding to hostile actions by Palestinians. Reacting in a wholly disproportionate way, in my opinion, but still reacting. When Ian Smith issued a unilateral declaration of independence for Rhodesia i 1965, the world – rightly – rejected his attempt at establishing an illegal regime. Ben Gurion’s identical behaviour in 1948 was not supported – though also not opposed – by the British (the existing Mandate Power for Palestine), who cowardly abstained on the question of UN recognition. They should have voted against it. By blackmailing Truman in the US and by gulling the Soviets into thinking that the new regime would be similar to a Soviet one (which ensured the supply of Czech fighter aircraft to the zionists), coupled with the usual “sell-out” short-sighted tactics of the French and by buying-off the venal Nationalist Chinese, the zionists were able to push through a motion of recognition. However, then – as now – a number of existing UN countries voted against recognition of the illegal zionist state. Those that voted against were six of the then seven members of the Arab League (Egypt, Iraq, Lebanon, Saudi Arabia, Syria and Yemen) as well as Afghanistan, Burma, Ethiopia, India, Iran and Pakistan. Those abstaining were: Belgium, Brazil, Denmark, El Salvador, Greece, Siam, Sweden, Turkey and United Kingdom. At present, a total of 32 United Nations member states do not recognise the State of Israel: 18 of the 21 UN members in the Arab League: Algeria, Bahrain, Comoros, Djibouti, Iraq, Kuwait, Lebanon, Libya, Morocco, Oman, Qatar, Saudi Arabia, Somalia, Sudan, Syria, Tunisia, United Arab Emirates, and Yemen; a further 11 members of Organisation of Islamic Cooperation: Afghanistan, Bangladesh, Brunei, Chad, Guinea, Indonesia, Iran, Malaysia, Mali, Niger, and Pakistan. Other countries which do not recognise Israel include Bhutan, Cuba, and North Korea. As you can see, I am by no means alone in not considering the zionist thugs in Occupied Palestine to be a legitimate regime. Through the use of naked force and terrorism, they set up their illegal regime and they have continued to maintain it through continued terrorism. This may be a de facto regime but it is never a de jure one. Where they are today is virtually identical to the Nazi occupation of France in 1940. If you go to https://www.google.co.uk/search?q=German+occupation+of+France+1940+map&biw=1366&bih=659&tbm=isch&tbo=u&source=univ&sa=X&ved=0ahUKEwi94oyJ_cjMAhVFrxoKHRi7BYQQsAQITg&dpr=1 you will see exactly what I am talking about and how the zionists have manipulated the map of Palestine in an almost identical way to the way in which the Nazis did in France in 1940 and onwards. The zionists not only engage in disproportionate force; they engage in ethnic cleansing of Palestinians on a regular and routine basis. The call it “mowing the grass” or “….the lawn”. Why should their criminality and fascistic behaviour be accorded any kind of respectability or other form of acceptance? They are the principal causation of much of the world’s problems today. It is the sheer unjustness of the treatment they mete out to Palestinians which has led to a global war of terror; a war the zionists both welcome and promote to their own benefit. If you want to at as an apologist for murderers, then do so. I will never see them as anything but racist supremacist thugs. Hang on – are you now suggesting that I support Israel, after others have attacked me for opposing that country? I oppose Israel for particular reasons. None of those reasons involve the legality of the Israeli state. A vote was taken in the UN and passed by a majority. It is, therefore, legal. Your own personal disagreement with that result, along with that of those countries that voted against or abstained, is irrelevant. The decision stands. You would do better to concentrate on the wrongdoings of the Israeli state than to undermine yourself by constant reference to an alleged illegality that is not supported by the evidence. Mike. Whilst it’s clear you’re not overemphasising this article there is something about both its narrative. origin and evolution that seems a bit, ummm, iffy? Considering my comments about it, I’d have to agree.